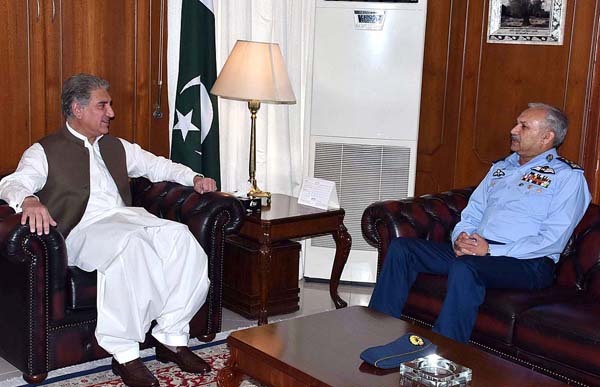 ISLAMABAD, Aug 28 (APP):Chief of Air Staff, Air Chief Marshal Mujahid Anwar Khan called on Foreign Minister Shah Mehmood Qureshi here in the Ministry of Foreign Affairs on Tuesday. The Air Chief congratulated Shah Mehmood Qureshi on his assumption of foreign minister’s office, a press release issued by the Ministry of Foreign Affairs here said. During the meeting, discussions focused on matters related to Pakistan’s security and foreign policy. The minister and the Air Chief also discussed the current strategic environment, including the regional and international situation, and the security challenges facing the country. The Foreign Minister apprised the Air Chief about the vision of the new government. He also complemented the professionalism, commitment and preparedness of the Pakistan Air Force in defence of the country. The Foreign Minister wished the Air Chief success in taking the Pakistan Air Force forward as a professional force in 21st Century.